Specialy designed to accomodate moms before, during and after delivery. Front and side adjustments assure best fit. 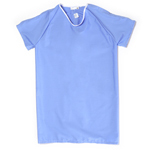 Deep neckline with tie or velcro closure for easy access for nursing. Quick and easy access with velcro snaps or ties. Two inch overlap on back for extra coverage. Pockets specialy designed for patients who need monitors . Inside or outside pockets and optional stablizing strap . Tie, snap, or velcro closure.